While it’s not exactly a Scripps National vocab word, the lengthy jargon may incite some intimidation. Put your children’s minds at ease by telling them ‘decomposition’ is just a fancy word for ‘breaking down’ or breaking apart’. Let them know that all you will be doing is breaking one big number into groups of smaller numbers, or place values. Be patient. We can all admit that “Why” questions can sometimes be a little annoying (especially when they turn into a seemingly endless succession of “Why’s”). However, your children have good reason to ask. If they are to perform a mathematical task, they should at least be aware of its function. Take the time to tell them how decomposing numbers will be useful to them. Young children, especially those that have mastered the single-digits, are usually very intrigued by the concept of bigger numbers or may already possess preliminary knowledge of multi-digit numbers. Teaching them how to decompose is a great way to help your children conceptualize large numbers. Now that you have properly defined the process of decomposing numbers and explained its utility, it’s time to get into the practical stuff. To begin, have your child practice determining place values. To begin, you should probably start with Tens and work your way up to the Thousands. This will be the most difficult part, so tap into your creative side to help your child visualize the groupings as you describe them. Draw pictures or use objects to depict the place values, then point out where each value is located in the multi-digit number. Supplement the depictions with writing out the expanded form of the number. Studies show the best way to gauge your children’s comprehension is to have them explain the process of decomposing numbers back to you. This display of understanding does not necessarily have to be verbal. Give your child a multi-digit number to tackle, start with the Tens. For example, if you tell your child to decompose the number 20, they may draw two ice trays, each with ten squares. Then have them write out the expanded form of the number to accompany their drawing. If the demonstrations seem a bit shaky, don’t get discouraged, simply revisit Step Three. Use the same method of depiction they’ve chosen and show them to correct way to decompose the given number. Now that your child has proven an understanding of numeric decomposition- Yay! Allow them to continue to practice in a way that is fun and challenging. 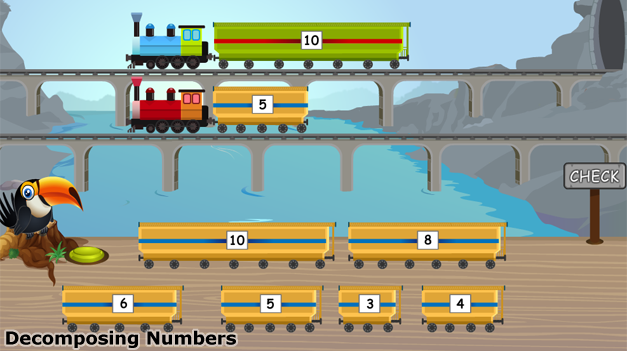 Utilize online learning tools, such as this decomposing numbers game to help solidify their decomposing skills. Very efficiently written information. It will be beneficial to anyone who employess it, including yours truly :). Keep doing what you are doing – can’r wait to read more posts. I just want to tell you that I am newbie to blogs and seriously enjoyed this blog. More than likely I’m want to bookmark your blog . You definitely come with exceptional posts. Bless you for revealing your web-site.